This is not your normal hostel where you are going to be cramped, bunking with 20 strangers. Our accommodations are deluxe 4 bed dorms with full en-suite bathrooms, air con, & free wifi throughout the entire resort. We also have private rooms with full en-suite bathrooms & air con. One of our common areas is on a fully furnished terrace overlooking the tropic jungle, with a plethora of books, games, & a hammock. The second and most popular hang out, is the largest resort pool in Head Rin! With our own private sunset beach, our place is the perfect spot for chilaxing amid all the parties. We also have a pool table, table tennis, water volleyball & a projector for some Netflix or early morning sports. Hungry?? Enjoy our delicious poolside restaurant & full cocktail bar! We have Pan! She’s the best cook in all the land!! Are you an animal lover? Chill with our house cat Lin Lin, or go paddle boarding with our dog who thinks she’s a dolphin, Scruffles. Our property features a full sized gym with cardio equipment, free weights, exercise mats, plus daily Yoga & Muay Thai sessions. We offer paddle board tours, SUP yoga, and guided jungle hikes. All our hotel guests receive a 25% discount. - Check-in Time: from 1pm. - Check out Time until 11am. (1) All customers are sent a paypal invoice requesting a 50% payment to confirm their booking. (2) If the Paypal deposit is not paid by the due date, the booking will be automatically cancelled. - Minimum stay requested on Full Moon Period and Peak season. This place is without a doubt the best place to stay in Haad Rin! They have everything you’d want... Super nice hostel rooms, amazing pool, yummy food at the bar and beach front property! Marissa and her staff were so fun and helpful too. It’s a nice place to stay if you want a bit more tranquil vibes, as it is like a hidden oasis tucked away from the party areas. 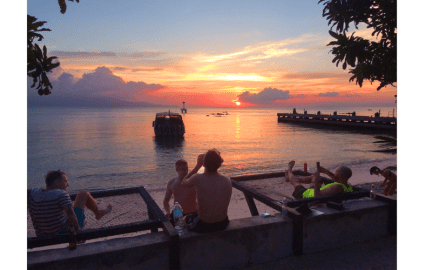 We came for the full moon party but wanted a calmer place to stay, so it was perfect! Eco resort was lovely. Pool was amazing and on a gorgeous little beach. We had a four bed dorm to ourself and really enjoyed our stay. The set up was a little odd with multiple hostels appearing to use the pool and no real central reception hub but Marissa made us feel really welcome and I’m so glad we chose here to enjoy our full moon experience from. 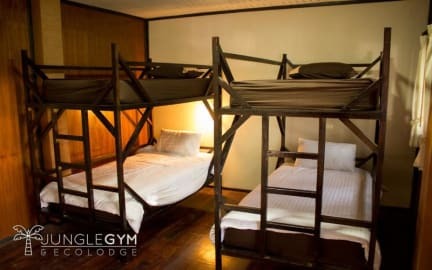 This eco lodge was in the perfect location to the full moon party where you don’t have to worry about cabbing back to your hostel after you were done partying. The space was like being in a jungle surrounded by lots of greenery. Access to the pool was amazing and was the highlight of the facility. It was barely crowded but had a great atmosphere. As a solo traveller it wasn’t the best space to make friends. I would definetely stay here again if I came with a large group of friends. Watch out for bed bugs! The friend I am traveling with got eaten alive. I was fortunate my bed didn’t have any as we were in the same dorm room. Other than the bed bugs it is a cool place to stay. The gym/cleaning lady was awesome. Bizarre set up. On arrival they had no idea about my booking. I originally booked a private twin room but was given a dorm, despite little to no other guests. At the end, tried to charge me for the original booking of a private twin room. No real reception or 24hours staffing. ‘Reception’ seems to be the gym which has limited opening times. Gate to the accommodation is locked after 8pm but no one told us so we had to come through the unlit back entrance late at night. Pool is however beautiful. We treated ourselves to stay here due to the fact it had a gym. We spent a little more thinking it would be luxurious. The place feels like an abandoned hotel with hardly any guests there. Had to pay extra fee to use the gym. Location was good and the lady on reception was very lovely. The front of the hostel is a gym. There is no hostel visible from the street and no reception desk. No staff were present and the gym was empty so we had to call to get someone to come out and let us in. The restaurant food was ok, but really slow, expensive, and the waiter got each order wrong. Our room had cockroaches and fire ants. The pool was nice, and it’s walking distance from the full moon party. Not much socializing among groups so wouldn’t recommend for solo travelers.